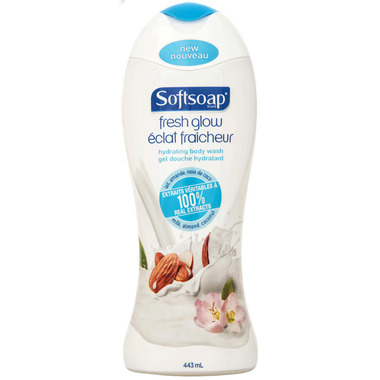 Softsoap Fresh Glow Hydrating Body Wash is a unique formula, that helps lock in moisture for healthy looking skin that glows! Made with 100% real extracts sourced from milk, coconut, and almond, this body wash is hydrating, clean and smells delicious. Ingredients: Aqua (water), Sodium Laureth Sulfate, Glycerin, Cocamidopropyl Betaine, Glycol distearate, Parfum (fragrance), Castoryl maleate, Laureth-4, Cocamide MEA, Sodium Salicylate, Sodiym Benzoate, Polyquaternium-7, Tetrasodium EDTA, Sodium Chloride, Citric acid, Citrus aurantium dulcis (orange) peel oil, Honey, Coco nucifera (coconut) oil, Hydrogenated jojoba oil, Butyrospermum parkii (shea) butter, Prunus amygdalus dulcis (sweet almond) oil, and Milk protein. This is the only hand and body soap I use generally(sometimes Dove) but I love the coconut scent and the suds! I use this one for my hand soap dispenser even tho it says shower gel!